Today technology has created a world of dazzling progress, growing disparities of wealth and poverty, and looming threats to the environment. Technology: A World History offers an illuminating backdrop to our present moment--a brilliant history of invention around the globe. 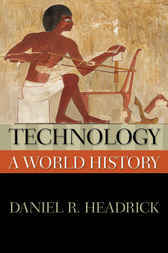 Historian Daniel R. Headrick ranges from the Stone Age and the beginnings of agriculture to the Industrial Revolution and the electronic revolution of the recent past. In tracing the growing power of humans over nature through increasingly powerful innovations, he compares the evolution of technology in different parts of the world, providing a much broader account than is found in other histories of technology. We also discover how small changes sometimes have dramatic results--how, for instance, the stirrup revolutionized war and gave the Mongols a deadly advantage over the Chinese. And how the nailed horseshoe was a pivotal breakthrough for western farmers. Enlivened with many illustrations, Technology offers a fascinating look at the spread of inventions around the world, both as boons for humanity and as weapons of destruction. Daniel R. Headrick is Professor of History and Social Science at Roosevelt University in Chicago.